The image of the Child Jesus known as the “Infant Jesus of Prague” is of Spanish origin. 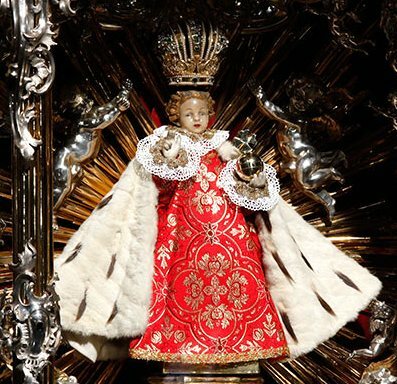 So many graces have been received by those who invoke the Divine Child before the original statue that it has been called “The Miraculous Infant Jesus of Prague”. All who approach the miraculous statue and pray with confidence receive assistance in danger, consolation in sorrows, aid in poverty, comfort in anxiety, light in spiritual darkness, streams of grace in dryness of soul, health in sickness and hope in despair. Photo by: © Fotobanka ČTK, René Fluger; License: Creative Commons by 3.0 (read the license).